I just discovered a great toy site that features frequent review updates. BattleGrip.com is a great place to spend some time drooling when you need a break looking at zombies drool. What drew me over there were two great zombie toy reviews. Both items should look familiar to readers of Zombies & Toys. If they don't, head over to the Zombie Toy Store. I mentioned before that Mezco has released a limited edition black and white zombie Mez-Itz. I was taken back at first by its $25 price tag until I read this review and found out there were only 108 made. 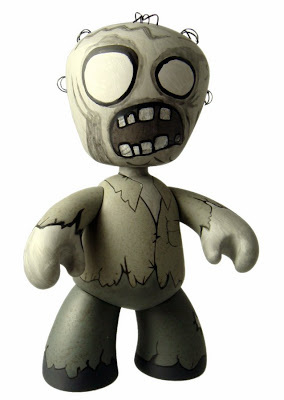 The color version is limited to 500 pieces and is available through Zombies & Toys for $18. So take a moment and go read the great Zombie Mez-Itz review from BattleGrip.com. Then head over to Mezco to pick up one yourself or head over to my store for the color version.